CMI researcher Robert V. Fox, Ph.D., a distinguished senior chemical research scientist, joined INL in 1989 and is active in performing and directing innovative scientific research in the areas of supercritical fluid chemistry, metal complexation reactions, nanomaterials, alternative fuels, laser surface cleaning, and laser spectroscopy. Dr. Fox has a broad level of experience in the areas of radionuclide interaction with porous media; radionuclide decontamination; chemical weapons destruction; laser cleaning of chemically contaminated surfaces; synthesis of munitions using electrochemical processes; synthesis of munitions in supercritical fluids; supercritical fluid catalysis; supercritical fluid extraction and separations; nanoparticle synthesis in supercritical fluids, spectroscopy in supercritical fluids; geochemistry; metal-complexation reactions; and many forms of molecular and atomic spectroscopy. Dr. Fox has technical leadership responsibilities in research tasks and has been Principal Investigator of a number of successful programs for the U.S. Departments of Energy, Defense, Homeland Security and other government organizations, plus private industrial companies. 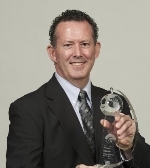 Dr. Fox received two international R&D 100 awards for patented inventions; Precision Nanoparticles in 2009, and Supercritical Solid Catalyst in 2010. The Supercritical Solid Catalyst invention was awarded a 2010 Gordon Battelle Prize for Technology Impact as well as receiving 5 other innovation awards. Dr. Fox has been issued 20 U.S. patents and authored more than 25 peer-reviewed publications. Dr. Fox is the recipient of an INL Laboratory Director’s Award in 2009 and again in 2010. Dr. Fox was also named the INL Inventor of the Year for 2009 and again in 2010. Most recently, Dr. Fox was selected as the Idaho Innovator of the Year at the 2010 Idaho Innovation Awards, and was nominated R&D Magazine’s 2010 Scientist of the Year. For the Critical Materials Institute, Dr. Fox previously led the project "Supercritical Fluid Beneficiation of Waste Streams." A key goal of the project was to improve reuse and recycling of materials critical to clean energy.